TBR & TBD October 2017 — TBR, etc. SO many good books to look forward to in October! I swear, some months I have to scramble to find 3 books to talk about, but this October isn't one of those months. #1 to add to your required reading list: a new Ta-Nehisi Coates book- We Were Eight Years In Power: An American Tragedy. Of course, you might know Coates from his last book, Between The World And Me. His new one is a collection of short stories that captures the administration of our first black president and the backlash of having a black president in the form of what Coates calls America's "first white president". This is going to be a provocative book, but anytime Coates has something to say, I'm listening. We're super being spoiled by the King family this fall. First, Sleeping Beauties by Stephen and Owen King and and now a new Joe Hill. Strange Weather is collection of short stories, each with a supernatural element that mirrors the realities of today. I'm thinking it'll be a literary version of one of my favorite shows, Black Mirror. I’ve never read anything from Joe Hill, but his book The Fireman is high on my list. A part of my literary goal is to read more authors of color and more female authors. I Am Not Your Perfect Mexican Daughter first got on my radar because Brandy Colbert, Author of Little and Lion (and one of my favorite Twitter follows) talked about it on the Professional Book Nerds podcast. Specifically, Colbert referenced how there was a trend toward reading diverse books with the #ownvoices movement, but that it seems to have petered off. Anyway, the protagonist of this book is Julia, who’s just 15. She loses her older sister Olga in a devastating accident and is faced with having to stand in her her dead sister’s very traditional and prominent shadow. It’s supposed to be an intense book with a look into family and expectations from the lens of Mexican culture. It sounds like it’ll be a book that will stick with you. I have mixed feelings about this. As you might be able to tell from the long subtitle, Member of the Family tells the story of what it was like to be a member of the Manson family. It was written by Dianne Lake, the youngest member of the family. She was just 14 when she became one of "Charlie's Girls" and she had permission from her parents to join his tribe. It's a story of brain washing and manipulation and what it took to find her way out from under his spell. It sounds to me like it'll offer up the real story of what The Girls tried to be. Yayyahh! Another John Green book. He’s one of my favorite authors (best known for TFioS) but I also really enjoy his candor and personality. He runs a YouTube channel called VlogBrothers with his brother Hank, and their podcast Dear Hank and John is one that I consistently listen to. I love how open he is about his struggle with mental illness an as an author (his video “On Failing to Follow Up The Fault In Our Stars” was so moving. I can’t imagine the pressure). 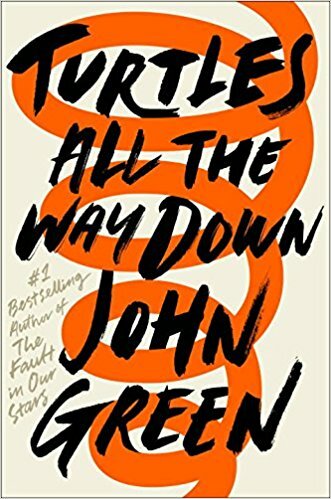 Turtles All The Way Down is his first book since TFioS and the expectations are out of this world. I don’t know a ton about this book other than it’s a young adult book that features a female protagonist with mental illness. That’s clearly enough for me, because it’s already on pre-order! I’m sure I’ll read this in a day and I can’t wait. Any other October must reads on your radar?